The arrival of Christmas in Bromley is well and truly heralded by the opening of Aladdin at the Churchill Theatre. Starring Scott Maslen as the villain Abanazar, Jess Robinson as Slave of the Ring and Bobby Crush as Widow Twankey, Aladdin is a glittering and fast-paced extravaganza, providing a memorable retelling of the classic story. 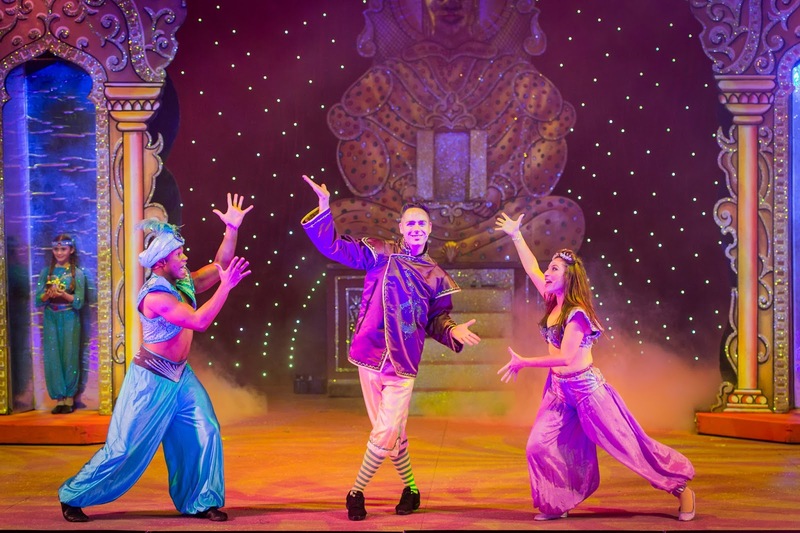 It stays true to the panto tradition – audience participation is plentiful, and ably lead by Mark James as Wishee Washee, son of Widow Twankey and brother of Aladdin. On the occasions when he breaks character, he only adds to the comedic value of the production. There is some slapstick, including a fun Laurel and Hardy-esque scene where PC Pong and Wishee Washee attempt to help with the laundry to, of course, disastrous effect. Inclusion of chart hits such as Uptown Funk and Dear Future Husband, reworked for the show, serve to get the audience singing along. And the audience is also eager to join in whenever possible, not least of all to boo Abanazaar whenever he appears. Scott Maslen’s portrayal is reminiscent of Jim Carrey’s Grinch – and brilliant. His energy and vocals make him the perfect villain. Jess Robinson also deserves special mention. Far more than an unwilling sidekick to Abanazaar, she brings a whole new dynamic to the production. Her impressions of celebrities from Tess Daly and Anne Robinson, to Cheryl Fernandez-Versini and Jessie J are spot on and, with a powerhouse voice to boot, the reception she receives from the audience only increases as the show goes on. Rounding off a 2015 programme of rich and varied shows, Aladdin is the must- see grand finale that the Churchill Theatre deserves.